Tired of Slow computer. Follow these simple step to speed it up. Here are steps for Microsoft Windows users that can help speed up the computer or determine the reason why is it running slow. Reboot: If your computer has not been rebooted recently, make sure to reboot it before following any of the steps below.Background programs: One of the most common reasons for a slow computer is programs running in the background. Remove or disable any TSRs and startup programs that automatically start each time the computer boots. Delete temp files: As a computer runs programs, temporary files are stored on the hard drive. Deleting these temp files can help improve computer performance.First, we suggest using the Windows Disk Cleanup utility to delete temporary files and other files no longer needed on the computer.Unfortunately, the Disk Cleanup may not delete every file in the temp directory. Therefore, we also suggest deleting temporary files manually. To do this, open run and type "prefetch", "temp" and "%temp%" one by one and delete the file present there. If any files are in use and cannot be deleted, they can be skipped. Free hard drive space: Verify that there is at least 200-500MB of free hard drive space. This available space allows the computer to have room for the swap file to increase in size, as well as room for temporary files.Bad, corrupted or fragmented hard drive: Run ScanDisk, chkdsk, or something equivalent to verify there is nothing physically wrong with the computer's hard drive.Run Defrag to help ensure that data is arranged in the best possible order.Use other software tools to test the hard drive for any errors by looking at the SMART of the drive. Scan for malware: Today, spyware and other malware is a big cause of many computer problems, including a slow computer. Even if an antivirus scanner is installed on the computer, we recommend running a malware scan on the computer. Use the free version of Malwarebytes to scan your computer for malware. Scan for viruses: If your computer is infected with one or more viruses, this can cause your computer to run slow. If your computer does not have an antivirus program installed, you can run Trend Micro's free Housecall online utility to scan for viruses on your computer, as well as remove them. It is also recommended that you install an antivirus program for active protection against viruses. Hardware conflicts: Verify that the Device Manager has no conflicts. If any exist, resolve these issues as they could be the cause of your problem. Update Windows: Make sure you have all the latest Windows updates installed on the computer.If you are on the Internet when your computer is slow, make sure all browser plugins are up-to-date. You can also try disabling browser plug-ins to see if one of them is causing the slowness. Update your drivers: Make sure you have the latest drivers for your computer hardware, especially the latest video drivers. Having out-of-date drivers can cause an assortment of issues, including slow performance. Reboot computer again: If you have done any of the above steps but your computer is still acting slow try rebooting the computer again at this point. Memory upgrade: If you have had your computer for more than two years, you may need more memory. Today, we suggest computers have a minimum of 1 GB of memory (RAM) for a 32-bit system and 2 GB for a 64-bit system. By having enough memory for programs to run within memory, your computer will not need to swap information stored in memory to the swap file. If the hard drive light is constantly active, it can be an indication the computer is frequently swapping information between your memory and hard drive. Hard drive upgrade: One of the biggest bottlenecks of a computer is the hard disk drive. Upgrading from a hard drive to a Solid State Drive (SSD) can significantly improve the performance of a computer. Run Registry cleaner: We normally do not recommend Registry cleaners. 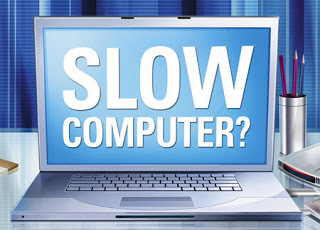 However, if you have followed all of the above steps and your computer is still slow, try running a Registry cleaner on the computer.Computer or processor is overheating: Make sure your computer and processor are not overheating. Excessive heat can cause a significant decrease in computer performance because most processors automatically reduce the speed of the processor to help compensate for heat-related issues.Dust, dirt, and hair can also constrict proper airflow inside your computer, which can cause a computer to overheat. Make sure your computer case is clean and fans are not obstructed. Erase computer and start over: If none of the above solutions resolve your issues, another option is to either reinstall Windows or erase everything and then start over.Erasing everything and starting over can increase performance by getting rid of old software or drivers that may be on the computer and causing the computer to be slow. Installing a fresh copy of Windows, software programs, and the latest drivers help verify there are no software related issues causing your computer to be slow. Hardware issues: Finally, if your computer is still slow after trying all of the above recommendations, there may have a more serious hardware related issue, such as a failing component in the computer. Examples of failing hardware could include a failing or bad hard drive, CPU, RAM, motherboard, or another component.You can run hardware diagnostic tests using the Ultimate Boot CD (UBCD) utility. This utility provides many diagnostic tests that you can run and determine if your computer has a bad piece of hardware. Old computer: If your computer is more than five years old, the age of the computer could be the cause of the slow performance. As more advanced software programs are released, they are optimized to run more efficiently on newer computers. Older computers are not able to run these new programs as well, which can cause them to perform more slowly. We recommend that you consider purchasing a new computer or accept that your computer is not going to be as fast as a newer computer.